To create partnerships and networks by connecting with people, businesses - public and private, from all over to spread awareness of the services of the Waianae Community Outreach, Its' mission, vision, values and goals; to gain support to continue and expand services and become 'THE' community outreach - servicing more than just the Waianae Community. To be sponsored annually by it's network and partnership connections of 100,000 people with a commitment of $1 without duplication and the assurance that the WCO will not ask for any additional pledges from those connections for 12 months after initial pledge. In order to achieve this, we are targeting 100,000 new partnerships annually and by 2020 to be connected to over 1,000,000 people who have supported us through sponsorship of $1. Additionally Waianae Community Outreach will in turn donate all proceeds over the $100,000 annual mark to charities, organizations, and partnerships that help the Waianae Community Outreach achieve it's mission, vision, values, goals in serving communities in order to continue and expand services. In order to be connected and keep all partnerships up to date of events, activities, and services that WCO provides, we are committed to daily/weekly blogs, e-newsletters, video, pictures, over social networking sites such as twitter, facebook, myspace and the official WCO website. All communication sources are meant to be as interactive as possible to include blogging by staff, new, present, former clients, and partners. * We have listed below the 5 biggest priorities that we intend to use the campaign funds to address. Our Outreach services puts staff out on the beaches 4 days a week spanning the area from Barbers Pt./White Plains Beach out to Kaena Pt.. The Outreach teams primary focus is to assess and assist families with needs such as hygienic materials (i.e. soap, shampoo, towels, etc. ), food, homeless verification and applications for shelter or housing access, benefit application for medical and financial assistance to name a few, and creates a sense of security for families to know that when they are ready the teams can assist them to move toward self-sufficiency how ever they see fit. Home for our Drop-in Site. Our Drop-In site houses the Outreach Department as well as our Fiscal and Information Data Department. Currently we are in an aging facility and have survived an electrical fire. We are looking to find a place of our own that can permanently house our teams on the Waianae Coast as well as also offer space for partnering agencies and individuals providing services to our clients and residents of the coast fee free. We currently are the only State Funded Outreach Program not affiliated with a Medical Care Facility. Our sister State Funded Outreach Agencies, Waianae Coast Comprehensive Health Center (WCCHC), Waikiki Health Center (WHC), and Kalihi-Palama Health Care for the Homeless Project are focus on health care for the homeless/houseless individuals and families, in contrast Waianae Community Outreach offers a community approach to outreaching. We utilize community members of the targeted areas to service the homeless/houseless community. We value community oriented individuals who have experienced a circumstance of homelessness/houselessness that can talk to families with empathy and as if they were they're own Ohana rather than a case manager to client approach. We have planned to utilize the 'community based outreach model' in collaboration with various shelters, sister outreach programs, and service providers in communities outside of the Waianae Coast. Our average gross annual salary is 19,000, which is 2x less than the average social case worker with high school education salary. The last pay raise for staff came in 2004 when there were only 4 total staff. Since 2006 we have had grown in staffing and are now, in 2009, at 25 total staff. We intend to provide annual performance based raises as well as incentives for continuing education as all of our staff are entry level with a minimum high school education. Currently we average 5 years length of service of employees, with 3 of 25 exceeding 7+ years of service. 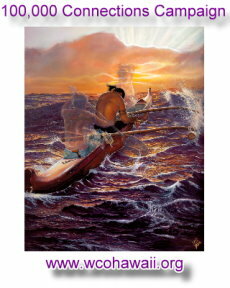 Waianae Community Outreach is a community based outreach program. Our goal as an agency is to be supported by the community and rely less on Federal, State, and City Funding. Click on "Connect" to become part of our extended network of supporters. � Waianae Community Outreach. All Rights Reserved.